Formerly a byproduct of business, in today's digital economy, data IS the business – and the marketing function has without a doubt undergone the most dramatic change within the organization. Marketing teams and their leaders have more technologies available than ever before, and while CMOs certainly believe in data driven approaches, many are still struggling to meet Sales’ expectations. The ability to make ROI-driven marketing channel and program mix choices is still elusive, making it difficult to demonstrate marketing’s value to the business. 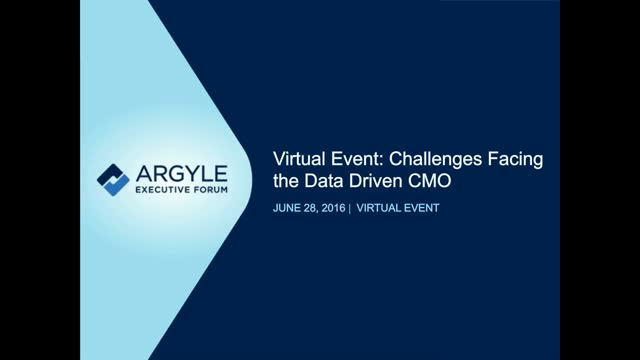 How can CMOs build the culture and infrastructure to support a data-driven marketing engine that converts pipeline to revenue? And how can they achieve an end-to-end line of sight to better understand which customer interactions make a difference? Further, how can the modern CMO put a MarTech stack together that not only enables them to understand the customer experience, but also drive it?